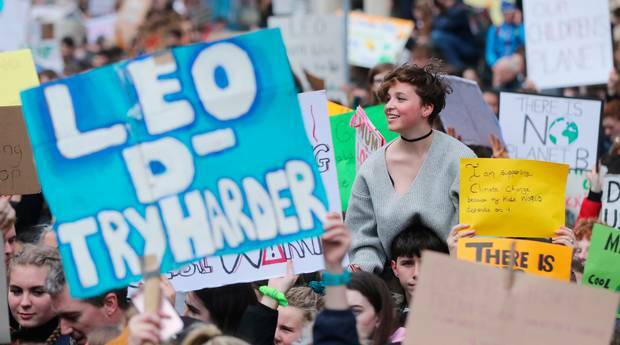 Thousands of young people took to the streets of Dublin City Centre today to protest against climate change, calling on the government to take action to protect the future of the planet. The demonstrators marched the short distance from St. Stephen’s Green as far as Molesworth Street, facing Dáil Éireann. Dubbed the #SchoolStrike4Climate by the organisers, it coincided with a number of other protests around the world. Many school students had made it known over the past few weeks that they would be striking in order to attend the march, which was organised largely through the means of social media. Some schools actively encouraged their students to attend, acknowledging the severity of the issue and the effect it will have on future generations. Primary school students, secondary school students, teachers, parents and other supporters of the strike were in attendance. A number of signs at the event called for “system change, not climate change”. Students from all around the country made their way into Dublin’s city centre for the demonstration which, coupled with the numerous other protests worldwide, they hope will put pressure on their government to take action on the issue of climate change before it is too late.